Not for the faint of heart, T-Rex X-Metal Grilles scream a rugged aggressive look with its chrome lug bolts on the laser cut frame and X-Metal logo mounted on the formed mesh. When they see this grille they know your truck means business. Manufactured in the USA and available in black powder coat or polished stainless steel to set you apart from the crowd. X-Metal Grilles are designed for the extreme truck and SUV enthusiast looking to make a bold statement. X-Metal Series Grilles feature an aggressively studded perimeter surrounding the formed heavy gauge mesh. Each stud is embedded with X-Metal branding and every grille includes our patented X-Metal Grille Logo. Grilles come in black or polished stainless steel finishes and are available with black or chrome studs. With more than 17 years of cutting edge development, T-REX Grilles has become the world leader in aftermarket grille design and manufacturing. T-REX Grilles’ state of the art 55,000 square-foot Southern California facility supports more than 100 American jobs – production, design, research and development, marketing and corporate staff- And each and everyone dedicated to one singular purpose: Producing the finest automotive grilles and accessories available on the market today. This dedication and American craftsmanship shows in every product that leaves the T-REX Grilles facility. T-REX Grilles line-up includes their traditional Billet Series grilles, aggressive X-Metal Series mesh grilles, performance minded and red hot Torch LED Series grilles, luxurious Upper Class Mesh grilles, dynamic Graphic Series billet and mesh grilles and motorsports inspired Sport Series mesh grilles providing a grille design for every consumer’s style and taste. 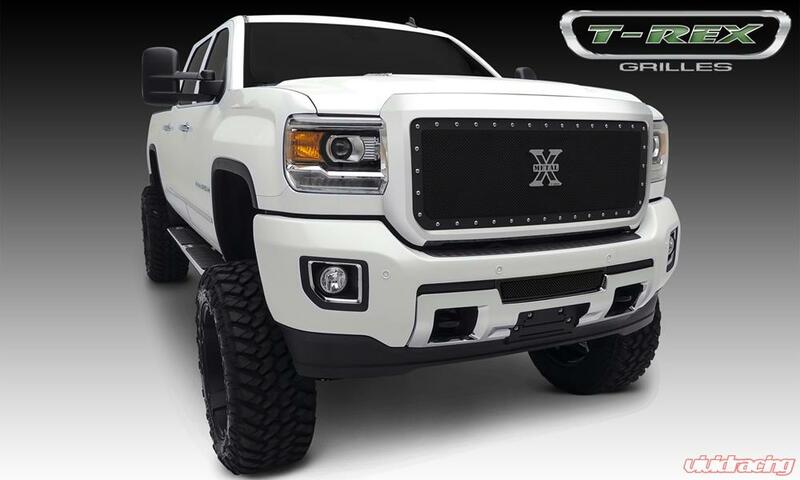 And T-REX Grilles boasts the most comprehensive application list available anywhere, with most styles and fitments in stock and ready to ship every day.